Okay, enough of that. What to do? “Simple enough…educate yourself. No, not with a medical degree…you see where that gets us. No, with pure and simple nutritional and whole-body knowledge. Also, with information on mental well-being and living life with purpose. A recent study of people well over 100 years revealed one common trait no matter their race, culture, place of origin in the world or if they were male or female, or even their religion….yes…a Universal Truth: Live life with PURPOSE. Fulfilled people live a long time. The second totally common trait among this group…live life for others first! What a world it would be if we all took a hint from these People of Wisdom! So, times are tough and we don’t seem to have time even for ourselves. But, is that really true? Do you know anyone who goes home, eats supper, calls a friend just to check on them, then, sits down with a good book for an hour or two. After this, they go for a walk or a jog, come home, shower and hop into bed; all before 9 P.M.? In this case, look in the mirror and see if you like what you see. If not, make simple changes…for the better. Know the secret of success?….do something little every day, till lots of little things add up to big changes. Why do flight attendants tell you to put the oxygen mask on yourself first? If you are OUT, how can you help those who cannot help themselves? Same for life! Get healthy so you can begin to learn the joy of living for others! Take your supplements, drink good, clean water, sleep no more or less than 7 hours a night, read product labels, eat more green veggies, eat more veggies with reds, yellows, purples and orange colors, walk, hike, call a friend, make a new friend, find a religion that answers the questions you have about the nature of the human spirit and it’s connection with the Universe, learn humility, practice patience, give away a parking space, let the person at the four-way stop go first. Relax in bumper-to-bumper traffic (since everyone else is in the same situation), watch a sunrise, watch a sunset…contemplate the heavens out in the country on a clear, dark night…love someone completely, be loveable. Tomorrow is a great time to start. Now is better. Remember, (Almost) none of the things above are ever mentioned in a hurried (5 minutes average) visit with The Doctor…why? Maybe, it’s because we just don’t need them to do the LIVING PART of life for us. Oh, sure…they fix things that break, put people back together in horrible situations, dispense every kind of pill ever invented and have a really large college and medical school bill to repay…but, the LIVING PART…let’s keep that for ourselves…our responsibility! 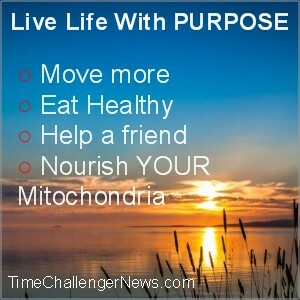 On our own, we can repair and enhance our mitochondria…the energy production systems in our cells. That might just be the most important health repair job we can start with on the journey to be able to put the “Oxygen Masks on Those Who Rely On Us! Get your energy up and watch what you can do! Then, watch what you can do consistently…because success is the very best motivator! Try Time Challenger for this first effort…okay, a shameless plug for an amazing product.